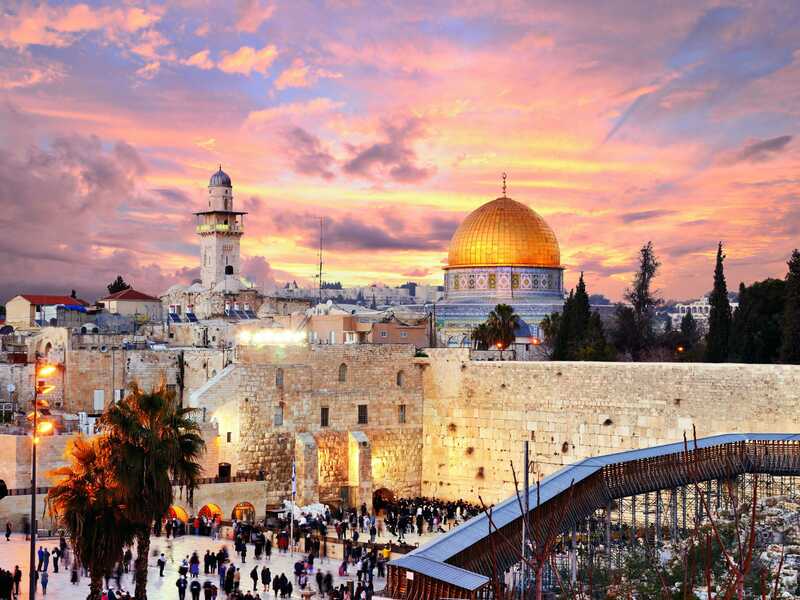 Although it’s changed hands some 61 times during the course of its 3,000-year history, modern-day Jerusalem is hardly the nexus of violence and controversy that it appears to be from the outside. The city of today is a sometimes contentious fabric of Jews, Christians, and Muslims, although once you’re there (as I was last week) these overly-broad categories start to feel like a trivializing over-simplification. 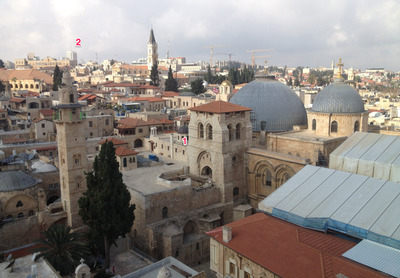 The city’s Christian community includes a millennia-old Armenian enclave and a Mormon college that’s only 25 years old; its Jews range from the black-clad Hassids of Mea She’arim or Kiryas Belz to the secular intellectuals who teach at the Hebrew University, or the westernized yuppies of who fill the cafes of Katamon and Rehavia. Most of the city’s Muslims, who live in the formerly Jordanian-occupied parts of Jerusalem that Israel took during the 1967 Middle East War, are mostly neither citizens of Israel nor subjects of the West Bank-based Palestinian authority. As scholar Johnathan Schanzer recently noted in Foreign Policy, a wave of protests and violent attacks over Israeli policies in the city have made Jerusalem “the epicentre of Palestinian unrest” for the first time in decades. There’s little reason to think that will change. And there’s no better place to get a sense of the city’s rich history and equally deep complexities than the top of the bell tower of the 19th century Lutheran Church of the Redeemer in middle of the old city’s Christian’s quarter. It’s offers a unique vantage point on Jerusalem’s spectacular built environment — and on where the city’s fault lines lie. Here’s what the view is like, and what it reveals. 1: The Dome of the Rock is one of early Islam’s architectural masterpieces and was built in the late 7th century, not long after the Muslim conquest of Jerusalem. Jews believe that the rock that the shrine encloses is both the Holy of Holies of the Jerusalem temple and the spot where Abraham nearly sacrificed his son Isaac in chapter 22 of the book of Genesis. For Muslims, the rock is where Mohammed ascended to heaven with the angel Gabriel at his side. The Dome occupies the site of several earlier buildings: the second and possibly first Jewish temples, a shrine to Jupiter constructed after the Roman destruction of the Second Temple in 70 AD. 2: The Al Aqsa Mosque is the third-holiest site in Islam. While it isn’t visible in this photo, the Mosque sits directly above the staircase and entranceway to the Second Temple, the remains of which are preserved in a nearby archaeological park. It’s also believed to be positioned above an ancient tunnel system connecting the long-destroyed Temple’s lower entry to its inner courtyards. 4: The Western Wall, the holiest site in Judaism — that Jews are legally and religiously permitted to visit. The Wall was an outer retaining barrier for the Second Temple built during King Harod’s upgrades to the original, more modest structure less than 100 years before its destruction. Parts of Wall actaully extend under the entire western length of the Temple Mount, but the current Western Wall Plaza is built around an area that has been a center of Jewish pilgrimage and prayer for centuries. There are two reasons Jews are not permitted to pray on the Temple Mount itself. One is religious: under Jewish law, a ritually impure individual cannot set foot in the Temple’s Holy of Holies. The other is political: the Temple Mount is under the stewardship of the Jordanian government, which holds the area’s Islamic holy sites in a religious trust. Jewish prayer on the Mount would be highly inflammatory to Muslims in Jerusalem and around the world and possibly even threaten Jordan and Israel’s 1994 peace treaty. The Western Wall represents a spiritual and temporal compromise — albeit a spiritually fulfilling one for Jewish visitors from around the world. 5: The East Jerusalem Arab neighbourhood of Silwan sits just outside the walls of the Jewish quarter — and on top of the archaeological remains of the original, 10th century BC city of Jerusalem mentioned in the Biblical books of Samuel, Kings, and Chronicles. 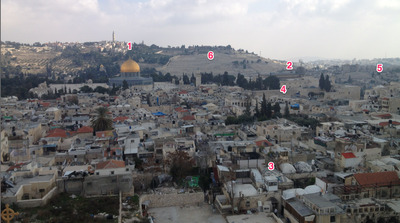 Attempts to develop the site as a tourist attraction, along with the Jewish acquisition of property around what some believe to be the Biblical “City of David,” are a major source of tension in the area. 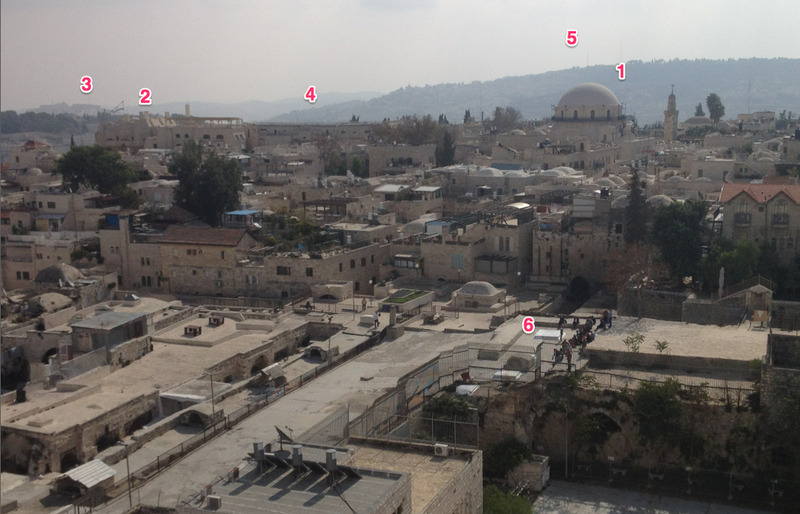 6: According to Jewish tradition, the Valley of Gehennom, between the Temple Mount and the Mount of Olives, is where the souls of the dead will be resurrected on judgement day. The centuries-old Jewish cemetery blanketing this side of the Mount of Olives proves that Jews have a long-standing desire to have a front seat for the occasion. 1:The Damascus Gate is the most ornate entry point to Jerusalem’s Old City. It’s also one of the most important places in Arab East Jerusalem, a hub of commerce and a place to catch buses heading into the West Bank. When the Israelis place limits on Muslims access to the holy sites on the Temple Mount, Friday prayers will sometimes take place on the plaza facing the gate. During the 1948 Middle East War, Jerusalem’s entire Old City was left under Jordanian military occupation. The closed border between Jordanian and Israeli controlled sectors of the city ran along a now-active highway just a few hundred yards from the Damascus Gate — at least until the Israelis seized the eastern half of the city during the 1967 war. 2: These high rises are the student dormitories of the Hebrew University in Jerusalem, Israel’s most prominent center for secular study. The small white dot just to the right is the British military cemetery on Mount Scopus, where thousands of troops killed during the allied World War I campaign against the Ottoman Empire — which included General Edmund Allenby’s dramatic march into Jerusalem — are buried. 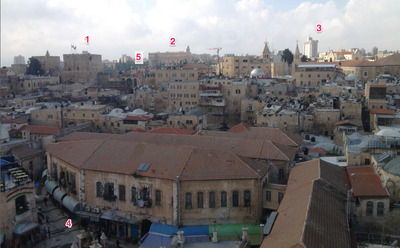 3: Though only vaguely visible in this photo, the Damascus Gate — the center of Arab East Jerusalem — is across the street from Mea She’arim, the most ultra-orthodox Jewish neighbourhood in Jerusalem and possibly the entire world. 1: The Jerusalem Citadel has been the Old City’s main point of defence for millennia — the current structure, built by the Ottoman emperor Suleiman the Magnificent, rests on top of walls and building foundations from pre-Roman times. This part of the city’s walls were also garrisoned with Jordanian soldiers between 1948 and 1967, a time when the over 2000-year-old barrier marked the boundary point between the Israeli and Arab-controlled halves of the city. 2: West Jerusalem’s King David Hotel was the British headquarters during post World War I mandatory period. It was notoriously the target of a bomb attack by Jewish paramilitaries in 1946 that killed 91 people, in the midst of an escalating three-way fight between Palestine’s Jews, Arabs, and British mandatory government over the region’s future. 3: This modern skyscraper towers over King George and Ben Yehuda Streets — basically the center of present-day downtown West Jerusalem. 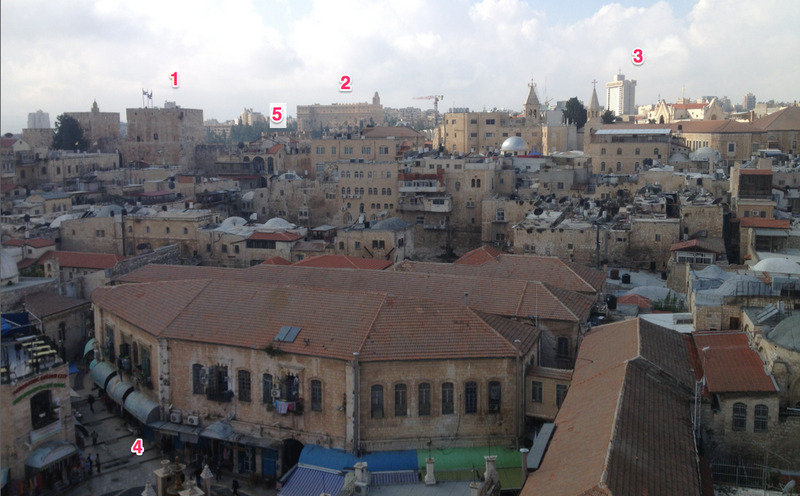 4: This intersection, called Muristan, is at the center of the Old City’s Christian Quarter. 5: This tree-lined hill is the site of Yemin Moshe, the oldest Jewish neighbourhood outside of the Old City’s walls. It’s been inhabited since the 1890s. 1: The Church of the Holy Sepulcher is where Jesus was crucified, entombed, and resurrected according to Christian belief. It’s the holiest site in the religion, and doesn’t occupy the space of any other, earlier shrine. But it’s still shared between a half-dozen Christian sects that occupy their own corners of sometimes-labyrinthine complex that dates from Byzantine and Crusader times. 2: This stark modern skyscraper is located in Zion Square — one of West Jerusalem’s central points. 1: Like much of the rest of the Jewish Quarter, the Hurva Synagogue was destroyed during the 1948 Middle East war; the Old City was then kept off-limits to Jews during the 19-year-long Jordanian occupation. The synagogue’s original structure dates to the 1860s, although the reconstructed building was opened in 2010. 2: The basement of the Wohl Building, which is now a Jewish religious study center, houses the millennia-old ruins of the part of the ancient city of Jerusalem where the Jewish priestly class lived before the Second Temple’s destruction in 70 AD. 3: The West Bank barrier is just barely visible in this photo. Constructed by Israel to stanch the wave of suicide bombings that hit Israel during the Second Intifada of the early 2000s and control West Bank Palestinian access to Israel proper, under 10% of the barrier is a concrete wall. It has turned into a potent symbol of Israel’s ongoing control over the disputed West Bank — the Palestinian Arab areas that Israel took from a vanquished Jordanian army during the 1967 Middle East War. More optimistically, the barrier, which largely (though not entirely) follows the post-1948 War Israeli-Jordanian disarmament line, could help demarcate a border between Israel and an independent Palestinian state if there’s ever a peace agreement. The wall sections reach up to 24 feet, and are a grim and ever-present reminder of the Israel-Palestinian conflict’s endurance. 4: These hills contain the predominantly Arab neighborhoods of Silwan and Abu Tur. These are poorer areas built into steep hillsides and are both physically and infrastructural cut off from more affluent neighborhoods in nearby West Jerusalem. 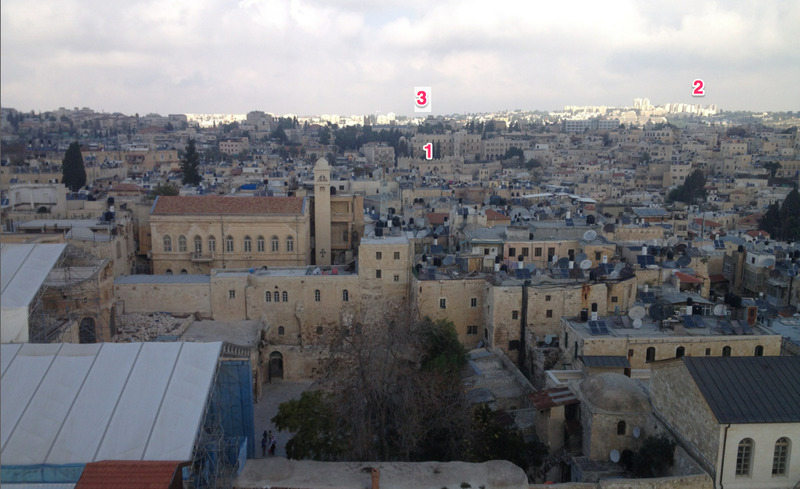 5: These antennas mark the headquarters of the UN’s observer mission in Palestine. With violence on the rise and no resolution to the Israeli-Palestinian conflict in site, the mission won’t be folding up shop anytime soon.